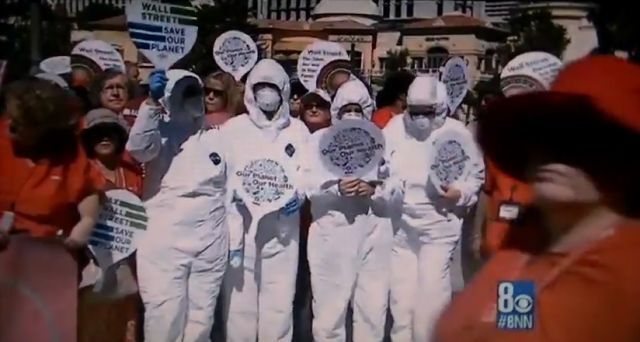 From writer Susan Duclos – All News PipeLine on Before It’s News: Excellent catch by Videographer Charles Walton of a Nurses Union protest in Las Vegas with direct quotes issued by the Planet Nurse at Planet Hollywood, where nurses took to the streets dressed in HAZMAT suits, holding signs in an attempt to bring the truth the American people, the same truth that many others have been warning about…… a warning of “danger and death,” should Ebola hit the United States, making it clear from the very people that would be on the front line, quite literally, that US hospitals are NOT prepared for an Ebola outbreak and those claiming anything to the contrary are outright lying. 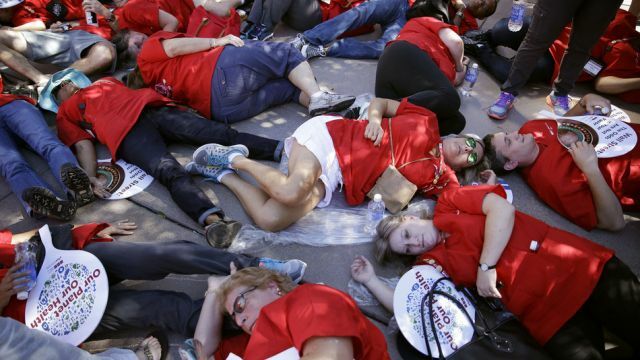 As Mashable reports, these nurses marched through Planet Hollywood Casino, the dropped to the ground in front of the Bellagio, pretending to be dead. Direct quote “Once on the ground, they outlined their bodies in chalk like a crime scene and wrote out the hashtag #StopEbolaRNRN.” (More photos from the #StopEbolaRNRN twitter hashtag found here). A study published earlier this month in scientific journal PLOS Currents, listed the top 16 countries at risk of being impacted by Ebola, including the United Kingdom, the U.S., Germany, and several African countries, such as Ghana and Nigeria. Ghana, the UK and Gambia had the greatest probability of seeing Ebola cases. After Walton’s commentary, the portion of the news clip dealing with the nurses protest that over 1,000 nurses participated in, starts at about the 5:15 minute mark.